Founded in 1981 by partners’ papa Val St. Regis and Tim Caswell in Hollywood, Studio Electronics have been at the forefront of manufacturing premium audio electronics and synthesizers for over 30 years. Well known for producing high quality rack mount programmable analogue synths like SE-1, SE have now taken everything they have learned making custom synths for the who’s who of the music industry and put their entire electronics prowess into the Boomstar and Boomstar Eurorack range. 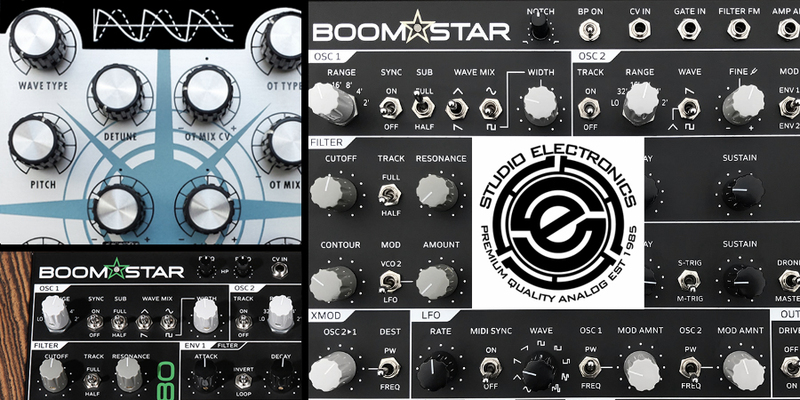 The Boomstar range is a collection of extremely high quality analogue synthesizers, all carefully hand built and tested with meticulous accuracy to ensure each module and synth lives up to their exacting standards. Boomstars come in a multitude of flavours: 5089 includes a copy of the original Moog Model D circuit, 4075 includes a circuit modelled after the ARP 2600, SEM is based on a classic 12dB Oberheim filter, 3003 is based on the classic squelchy Roland 303 filter, SE80 takes its flavour from the iconic Yamaha CS80 and the 700 being derived from the Minikorg. More recently Studio electronics have moved into modular, taking the same concept that bore the Boomstar range but moving into the ever growing and open world of Eurorack. We have the complete Boomstar range available online, call us today for expert advice or click online today to find out more.